The best way for urban planners to understand the different ways in which women use public space is to actually consult with women. This is a key point within safe cities for women programming. Women and girls are experts on their own safety and use of the city. Therefore, women and girls themselves must participate in the planning process in order to provide information on safety issues and on possible solutions. There are many strategies that allow women to participate in the planning process, including public consultations, focus groups, and surveys. An important aspect of these strategies involves gathering baseline information before starting a safe cities for women programme, activity, initiative or project. See the section on identifying safety problems. It should also be noted that, in order for the planning profession to properly understand and accommodate women, planning professionals must consider women’s uses and experiences of public space to be legitimate and important (Davies et al., 2002). Professional urban planners and designers and local government officials should not only seek women’s active participation and input in planning processes, but they should also ensure that this participation and input is valued and used. Sometimes, women and girls do not communicate in the same way that professionals and decision-makers do. Women and girls might talk about their emotions and reactions instead of just plain facts. This can be difficult for professionals and decision-makers to understand at first. However, this does not mean that women’s and girls’ use and experiences of public space are not legitimate and important (Davies et al., 2002). Use women’s concerns and fears as an input for planning and design. The fears and worries women experience will vary from community to community. The in-depth knowledge women possess about their accessibility to urban space provides important input for planners and designers who are unfamiliar with a particular space. Jagori Focus Group Discussion Presentation (2010). This PowerPoint presentation, produced by the Indian women’s organization Jagori, provides an overview of the process and results of safety-related focus group discussions they have held with different groups of women in Delhi. English. The women’s safety audit is a tool designed for women to use in order to build their skills and make their communities feel safer. There are three main principles which guide women’s safety audits. Firstly, in safety audits, women are considered experts on their own environment and security. Secondly, safety audits encourage local and context-specific solutions to issues of insecurity. Thirdly, safety audits promote partnerships between women and their local governments. Why is the Safety Audit a Useful Tool? The first women’s safety audit was created in Toronto, Canada, in 1989 by the Metropolitan Action Committee on Violence Against Women and Children (METRAC). Since then, many groups of women all over the world have used the women’s safety audit in their communities. Moreover, several versions of guides for women’s safety audits have been created by different organizations (see the resources at the end of this section). Some of the benefits that have been reported by those using the women’s safety audit tool include: changes to the physical environment to make it safer for women and the community as a whole, changes to local programmes and policies to make them better at promoting safety for women and the community in general, more funding and positive publicity for organizations and communities involved in women’s safety audits, more skills and confidence for women who participate in audits, and greater public awareness of women’s safety issues (Lambrick and Travers, 2008). The safety audit has been evaluated and is internationally-recognized as a ‘best practice’. Usually, a women’s safety audit starts with a group of women and possibly other community members, who meet together and discuss spaces in their community that feel unsafe. Safety audit groups usually work best when member viewpoints represent a variety of safety concerns (i.e. young and old women, disabled women, women from different ethnic backgrounds) (WISE, 2005, 13). Unsafe spaces to be considered by the group might include parking lots, pathways between residences and water sources, or public housing developments. After the safety audit group has chosen the unsafe space that they wish to audit, they go together to that space and note the factors or characteristics that they think make it unsafe (usually with the help of a premade checklist). See the “Identifying Safety Problems” of the “Programme Planning and Design” section for examples of checklists that are used. Factors or characteristics that make a space feel unsafe might include: poor lighting, negative graffiti messages, or an isolated location (Rodigou; Nazar; Monserrat, 2009). Once a safety audit has been completed, the group makes a series of recommendations to their local government and other community members to try and improve the space. For detailed instructions and tips on conducting a women’s safety audit, please refer to the guides and materials in the resources section below. Source: Women in Cities International, 2009. Walking our Neighbourhoods, Building Cities Free from Violence: Training material for neighbours to conduct participatory baseline assessments of their neighbourhoods so as to improve their habitability and social ties (Rodigou, M., with the collaboration of M. Nazar, 2008). CISCSA - Centro de Intercambio y Servicios Cono Sur – Argentina. Resources included: Guide available in English and Spanish; Safety Audit Checklist available in English and Spanish; Workshop Photos/Fotos Taller; Video available in English, Spanish and French. Women’s Safety Audit Guide: Safety for Women, Safety for Everyone, Let’s Act on It! Women’s Initiatives for Safer Environments (WISE) (WISE, 2005). Available in English. Cowichan Valley Safety Audit Guide, Cowichan Women Against Violence Society (Cowichan Women Against Violence Society, 1999). Available in English. Guide d'enquête sur la sécurité des femmes en ville (Guide for Investigating Women’s Safety in Cities), City of Montreal (Ville de Montréal, 1993). Available in French. Guide de réalisation d’un marche exploratoire (Safety Audit Guide), Town of Lévis, Québec (Ville de Lévis, Québec, no date). Available in French. METRAC’s Safety Audit Kit, Metropolitan Action Committee on Violence Against Women and Children (METRAC, no date). Available for purchase in English, French, Spanish, Chinese, Punjabi and Tamil from METRAC. Making Safer Places: A Resource Book for Neighbourhood Safety Audits, Cavanagh, S. (Women’s Design Service, 1998). Available for purchase in English. La marche exploratoire… Une façon simple d'amélorer la sécurité dans votre mileu (The Safety Audit… A Simple Way to Increase Security in your Area), Women's Commission of the City of Quebec (Commission Femmes Ville de Québec, no date). Available in French. Sécurité des Lieux: Guide d'évaluation (Secure Places: Evaluation Guide), Fédération des Infirmières et Infirmiers du Québec (2003). Available in French. For information on how the safety audit tool has been adapted to suit the needs of different groups of women, see the section on identifying safety problems for more information. Plan It Safe Kit (New South Wales, Australia, 1998). This is an online toolkit for creating safer public spaces for women. It is produced by the Safe Women Project. This toolkit outlines the issue of women's public safety in terms of perceived risk and everyday experience. It also discusses creating partnerships for women's safety among community groups, municipal governments, and public services. The toolkit also provides a guide for creating a local safety committee and working with urban planners on safe urban design. Raising awareness about and lobbying for women's safety is also discussed. Australian case studies and women's personal comments are included throughout the text. Available in English. Surveys (2002) in Women and Community Safety: A Resource Book on Planning for Safer Communities. (Cowichan Women Against Violence Society, 2002). Cowichan Women Against Violence Society: Chapter 4, pages 53 - 55. Surveys are tools that can be used by planners and others in order to learn about how women and girls feel in the spaces they use. This tool provides information on the steps involved in doing a survey, and also provides sample survey questions on women’s safety. Available in English and French. ‘Fearometer’. (Royal Town Planning Institute, no date): Section GPN7, page 10. The Women’s Design Service developed a Making Safer Places programme in Bristol, Wolverhampton, London and Manchester in the United Kingdom, using an exercise called a ‘fearometer’. This exercise is used to find out what makes women afraid by having women rate different elements on a scale which moves from “safe” at one end to “afraid” at the other end. Women then conduct audits of their local neighbourhood, estate or park to identify features of the physical environment which encourage crime or the fear of crime and make recommendations for improvements such as moving or removing vegetation, rerouting paths or installing fences. Available in English. Cuaderno de Propuestas. Más Mujeres en las calles sin miedo ni violencia. [Proposal Workbook: More Women in the Streets without Fear or Violence] (2008). This publication was produced by the UNIFEM Regional Programme “Cities without Violence against Women, Safe Cities for All”, implemented by the Women and Habitat Network of Latin America and the Caribbean. It provides a description of the places that women identified as "unsafe" and details the reasons why women feel unsafe in these places. The workbook includes proposals for local government officials on neighbourhood improvements. This material can be used by community-based and women’s organizations, as well as by public officials. Available in Spanish. Case Study: Plazas nocturnas (Night Squares) Project, La Pintana, Santiago, Chile. In a neighbourhood of Santiago, the “Night Squares Project” enables women to create or reclaim safe public spaces for themselves and their community. While still in its early stages, project has been focusing its efforts within poor areas on the outskirts of Santiago. The initiative is dedicated to improving public space through planning and design processes which include input from local women. The spaces that result from these actions are called “night squares”. A “night square” is a public square that is transformed from an unsafe and unwelcoming space for women at night into a space that is safe and appealing for women at night. Common interventions include the addition of lighting, open-air markets, movie nights, and exercise equipment. Once a “night square” is transformed, it represents an expression of women’s right to the use public spaces in the city. Developed in the framework of the UNIFEM/Red Mujer y Habitat Regional Programme “Cities without Violence against Women, Safe Cities for All”. Available in Spanish. > To highlight the access problems of women as primary care-givers and to raise the awareness of planners and shop-owners on this issue. > To encourage the business community to redress the problems of access by way of giving one-to-three-star awards to those shops which provide better access and basic facilities. > To develop ways of involving women living and working in Greater London in all aspects of environmental improvements. > Various women’s community groups in Haringey participated at all stages in the implementation of this project, as well as in the decision-making process. The project resulted in the development of access guidelines for shops and facilities in town centres for the use of planners. From MOST Program. (no date). “Women And Accessibility In Town Centres: Open Sesame Project United Kingdom”. On MOST Clearing House Best Practices. Available in English. Use map-making as a way to express personal experiences and feelings of safety or insecurity. There are eye-catching pictures, colourful drawings, models and well-known symbols. HARASSmap (2010). This mapping programme allows Egyptian women and girls to send an SMS message on the type of harassment they experience and the location where it occurred. This information is collected and displayed on a public website. The website also provides space for user feedback and strategies for dealing with sexual harassment. Available in Arabic and English. 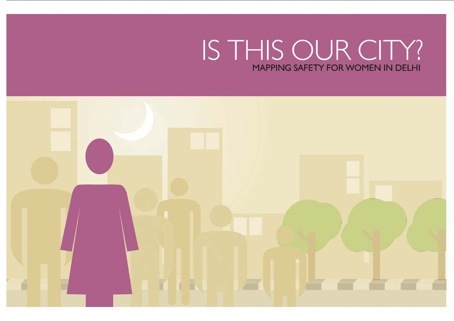 Maps from Gender Safety Audits for Public Spaces and Proposals for Safe Urban Spaces (2010) by the Municipal Corporation of Delhi and INTACH, Delhi Chapter. The Kibera Map project began in 2009. The purpose of the project is to map Kibera, Kenya’s largest slum. Before Kibera Map, the area appeared as a large blank spot on most maps. Project implementers argue that, “Without basic knowledge of the geography and resources of Kibera it is impossible to have an informed discussion on how to improve the lives of residents.” Now, residents and other people who use the area can go online and add roads, important landmarks and other factors which they think are significant to a map of Kibera. Young people are the project’s main audience. Themes on the map include health, education, water/sanitation and security. Available in English. STOP Street Harassment Global Map. This user-generated world map allows women to mark places on a map where they have been sexually harassed or assaulted on the street. Each marker on the map is accompanied by a story about the harassment that the woman or girl experienced. See the map. Map of the Locality of Kennedy in Bogota, Colombia (2010). 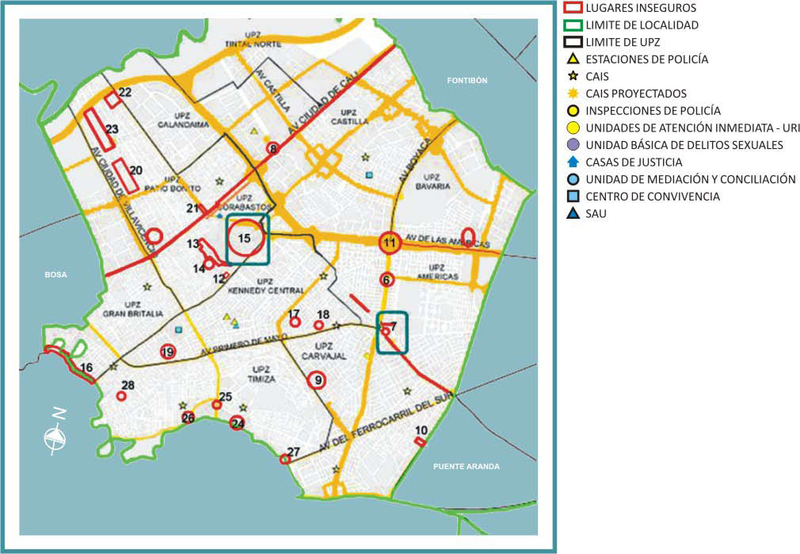 This map was created as part of the UNIFEM/Red Mujer y Habitat Regional Programme “Cities without Violence against Women, Safe Cities for All”. Image source: Red Mujer y Habitat Lationamerica. Case Study: ‘Map of the Forbidden City’, Office for Equality of the Basauri City Council and the Urban Women’s Collective of Madrid. In 2001, 20 young people were brought together to participate in the development of a “Map of the Forbidden City”. The workshop participants were divided into two groups, and each group identified spaces in the city that scared them. These places were then marked on a map. When the two groups came together to discuss their maps, it was discovered that there was consensus regarding which places produced fear. For example, both groups described isolated high schools, parks and sports fields surrounded by highways as unsafe areas. This discovery generated discussion about how to connect neighbourhoods and how to obtain subsidized public transit at night for young people. From page 32 of Aldasoro, E.; Sanz del Pozo, A. (2002). Mapa de la Ciudad Prohibida para las Mujeres. Una experiencia de participación con las mujeres jóvenes (Mapping the Forbidden City for Women: An Initiative for Young Women’s Participation). Basauri: Basauri City Council Department of Equality. Available online in Spanish. This book features a series of maps that women in New Delhi, India, have created. Each map documents elements which make them feel secure or insecure in their city. These maps are based on women's conceptions of their physical space and include information found in previous women's safety audits. Market areas, residential areas, transit areas, and university campuses are all mapped. Symbols are used to indicate different land uses, different kinds of businesses and public institutions, dark areas, dirty and unpaved areas, toilets, ATMs, etc. The maps are used to represent a clear relationship between insecure areas and the everyday spaces women inhabit (JAGORI, 2007). Available by contacting JAGORI. Activity: “Mapping” Activity (1998). This activity is located on pages 13–16 of Making Safer Places: A Resource Book for Neighbourhood Safety Audits by Sue Cavanagh. It focuses on how to use maps, create mind maps, read plans, and use models. Available for purchase in English. Community Mapping: A How-to Handbook for Grassroots Women’s Organizations. (Huairou Commission, 2007). This tool was developed to help grassroots women’s groups assess the needs of their community. Activities focus on women working with their communities to produce maps, surveys, focus groups, and interviews on common problems. Examples in this guide focus mainly on basic service issues, such as sanitation and housing provision. In some cities or communities, this might be an appropriate first step in diagnosing women’s insecurity (i.e. lack of shelter). In other cities or communities, where basic services are not a major issue, groups can adapt the community mapping technique to more explicit safety-related concerns, such as public violence. Available in English. Use existing information to make new connections regarding the relationship between violence against women and the characteristics of public space. In many communities, a great deal of data is recorded about public space and about violence (different forms of violence, who perpetrates violence against whom, where and when violence occurs). However, this kind of information is usually not collected for the purpose of clarifying the relationship between public spaces and violence against women. Safe cities for women programme partners can work with urban planners and designers to analyze already-existing information in order to explore these connections. Obviously studies that specifically address the gendered and spatial dimensions of violence are an invaluable resource for the planning and design process; however, since there is not an abundance of this sort of study, planners should be flexible and creative in terms of the data they consult. In this example, two maps of Santiago, Chile, are superimposed. One map depicts the locations of social housing complexes (built between 1980 and 2001) and the other map depicts the locations of places where crimes were reported in 2004. By comparing these two maps, a connection is made between social housing complexes and urban violence, specifically violence against women. (Rodríguez, Rodríguez, Saborido and Salas; 2008). Study available in Spanish. Image Caption: Locations of Social Housing Complexes and Concentrations of Complaints of Intrafamily Violence. This map illustrates the superimposition of georeferenced data corresponding to the locations of social housing complexes constructed in Santiago, Chile between 1980 and 2001 and the concentrations of complaints of intrafamily violence in 2004 archived by the Ministry of the Interior. Image Source: SitoSur. When planning and designing public spaces, consult with different kinds of women and different kinds of actors. Just as men and women experience space differently, there is no such thing as a homogeneous group of women and girls that share one common experience of the city. Different women may face different risks to their security based on a host of overlapping characteristics that make them vulnerable. For instance, there are various barriers in public places that only affect disabled women. Instead of approaching accessibility as a medical issue, safe cities programme partners can think of accessibility as an inclusion issue. From this perspective, planners and other actors can identify factors in the urban environment that stop disabled women from being included in urban life. Specifically, they can highlight the importance of universal design principles that make access to the city a standard right, and not a special benefit (Haniff-Cleofas and Khedr, 2005). The planning and design process must take into account different needs and interests, resulting in safety solutions that are suitable for everyone. As a result, the participatory design of public spaces can give voice to the needs and aspirations of different groups of women according to, for example, their age, level of ability, level of mobility, sexual orientation, political perspectives, ethnicities and socio-economic status. Thus, in contrast to public spaces designed with only one kind of person in mind, public spaces themselves can physically represent a diversity of women’s needs and visions (Segovia, 2008). In order to ensure a participatory and inclusive practice, safe cities planners and designers should consult various groups. This observatory was created by SUR Corporación de Estudios Sociales y Educación (SUR Corporation of Social Studies and Education) within the framework of the UNIFEM Regional Programme “Cities without Violence against Women, Safe Cities for All”, implemented by the Women and Habitat Network of Latin America and the Caribbean. The steering committee of the observatory is made up of three non-governmental organizations: the Centro de Estudios para el Desarrollo de la Mujer – CEDEM (Centre for Women’s Development), Cordillera and SUR. The observatory is a space for exchange, debate and analysis of diverse experiences of the city, developed by different actors at distinct scales. Discussions focus on gender, violence and urban space, with special attention given to the issue of violence against women. differently, and result in unequal opportunities for development and integration? - How can we promote a democratic coexistence in poor settlements? - Is it possible to reclaim poor neighbourhoods as territories? More information on the observatory on gender-based violence is available in Spanish. Case Study: Colectiva Lesbica Feministas Mafalda (Chile) [The Mafalda Lesbian and Feminist Collective]. The Mafalda Collective, based in Concepción, Chile, is an organization that works to raise awareness of the issue of the invisibility of lesbian women in mainstream city life, which contributes to acts of violence against lesbians not being considered punishable crimes. For example, the Law of Intra-Family Violence does not consider victims of violence within lesbian couples. Consequently, lesbian victims of partner violence have no recourse to the law. Additionally, in relation to the various types of violence lesbian women experience, the Malfada Collective highlights ‘lesbophobia’ as a form of hetero-normative violence that frequently goes unnoticed. More information is available on the organization’s blog in Spanish. Case Study: Music about women’s safety, Delhi, India. JAGORI, a women’s organization based in New Delhi, India, has produced several songbooks and cassettes based on the belief that songs are a part of the everyday lives of women and have been a medium of expression for sharing many unspoken and silenced emotions. By capturing these songs and their tunes in songbooks and cassettes, JAGORI has facilitated their outreach to every part and corner of the country. Many songs have also emanated from the very struggles of the women’s movement in India and other people’s movements. This approach can be adapted to issue of sexual harassment and other forms of violence against women in public spaces. The materials are available from JAGORI. Mujeres transformando los espacios publicos (Women Transforming Public Spaces) Video. Rosario, Argentina, 2009. This video documentary was created as part of the UNIFEM and AECID Regional Programme “Cities without Violence against Women, Safe Cities for All”, implemented by the Latin America Women and Habitat Network. This documentary shares the experiences of women in the West District of Rosario, Argentina as they work to assert their right to public spaces in thier community. In particular, this video documents several different transformative actions the women tool, as well as showcasing proposals and concrete activities carried out through participatory management with the local government. Available in Spanish. “What to Do About Women’s Safety in Parks”. (Women’s Design Service, UK, no date). This book details the findings of women’s focus groups and women’s safety audits in a number of parks and green spaces. A range of women were involved in the process, including women with different disabilities and women from varied ethnic backgrounds. The publication summarises the issues and design features that contribute to women’s actual and perceived safety in parks. It contains a series of extremely useful and practical “What to Do…..” sheets on topics such as “What to do about lighting” and “What to do about youths”. Available for purchase in English. Use qualitative data as an important source of information about public spaces. Qualitative data is information that is based on experience rather than on scientific fact. Examples of qualitative data include stories, songs, poems, interviews, letters, community discussions, focus groups, and surveys of community members’ perceptions, knowledge, attitudes and practice (for example, about violence and sexual harassment against women and girls in public spaces)—as well as findings from safety audits and related methodologies. Usually, records and documentation on women’s experiences of space and security are considered qualitative. This type of information is important for planning and designing safer cities because it contains women’s personal knowledge about the city. Urban planners and other decision-makers should prioritize the use of qualitative data when assessing whether public spaces are safe and accessible for women. For more detailed guidance and tools on qualitative (and quantitative) data, see the Monitoring and Evaluation Section in the Programming Essentials Section of this site.